Those good folk at Metroscreen put on a great event called Screen 2030: Making Content Pay and also produced this accompanying video, which gives a great insight into the future of content. The video includes my fellow Masters student Marcus Gillezeau, and Ester Harding who is in the year below me. And I’ve also worked with Galvin, Louise and Tim so lots of familiar faces in here. An exploration of the future careers of content makers by some of the screen and media industry’s key thinkers, discussing the issues of changing audiences and distribution for screen content. Metro Screen looks ahead to the next 10-15 years and asks the big questions: What will the screen industry look like in 2030 and will a creative screen career pay the rent? This entry was posted in Distribution, Funding, Video and tagged 2and2, Digital Kitchen, Firelight Productions, Galvin Scott Davis, Georgie McClean, Goa Hippy Tribe, Hoodlum, I Am a Girl, Louise O'Donnell, MARCUS GILLEZEAU, Mark Pesce, Metro Screen, Mike Jones, Moore's Cloud, Peter Giles, Portal Entertainment, Protein One, Sandy George, Screen 2030: Making Content Pay, SCREEN 2030: MAKING MY CONTENT PAY, Screen Australia, Screen New South Wales, Storm Surfers 3D, Tim Parsons on June 19, 2014 by n1ch0la5b0lt0n. Some more good research from The Arts Council looking at participation in the Arts. It doesn’t include film as thats the realm of Screen Australia but I am assuming that the statistics would have similar results if applied to the film sector as well, and thought the research would be of value to readers of this website. 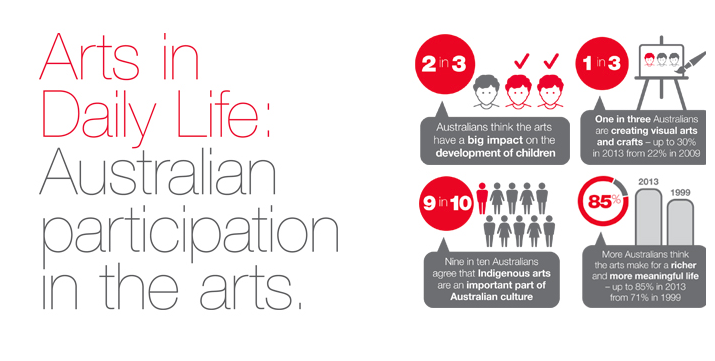 Arts in Daily Life: Australian participation in the arts is an independent study commissioned by the Australia Council, which provides insight into how Australians participate in the arts today. It provides a comparison of shifting attitudes and behaviours by benchmarking the findings in 2013 against those from the original study in 2009. The Council has a deep commitment to ensuring there is a sound base of evidence to lead and support a national conversation about arts and culture in Australia. We hope this report provides valuable insights and enables you play an active part in this conversation. This entry was posted in Research and tagged AFTRS, Arts in Daily Life: Australian participation in the arts, Australia Council, MSAB, Nick Bolton, The Art of Perseverance in Australian filmmaking on June 19, 2014 by n1ch0la5b0lt0n. Since its establishment in 1958, the AFI has played a central role in nurturing and supporting both screen culture and production, from the Australian film industry’s small beginnings to its development into an internationally recognised billion dollar industry. 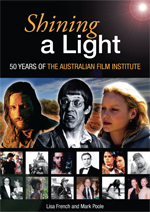 Shining a Light maps out the history of the AFI and the wider industry over the past fifty years and explores the relationship of screen culture to a successful production industry. The book offers a timely and significant contribution to scholarship on Australian cinema, and is published at a critical time in Australian film history. The authors have interviewed key players on the local scene, undertaken twenty-seven interviews, and sifted through volumes of documentary evidence to chronicle the history of the AFI, its successes and role in Australian screen culture past, present and future. This entry was posted in Books, Research and tagged AACTA, AFI, AFTRS, Australian film industry, MSAB, Nick Bolton, Shining a Light, The Art of Perseverance in Australian filmmaking on June 18, 2014 by n1ch0la5b0lt0n. We have just had the privilege of filming Director Kasimir Burgess and Producer John Maynard and hear them discuss their new feature film Fell. They have made the bold decision to release the film online. Here is the Media Release. Get your credit cards out and support this intriguing film! The 61st Sydney Film Festival and Adelaide Film Festival announce a video-on-demand stream of the Australian feature film Fell direct from its World Premiere at Sydney Film Festival on Tuesday 10 June. Sydney Film Festival and Adelaide Film Festival will break with tradition and stream online the World Premiere Australian film Fell over the same weekend that it premieres in Official Competition at the State Theatre in Sydney. Fell will screen in high definition to any Internet-enabled device: Smart TV, digital TV, touchscreen tablet, PC, laptop, game console or smartphone. It will be available on streaming for 50 hours from 8pm Friday 13 June EST until 10pm Sunday 15 June AEST. The film will be available to everyone in New South Wales, Queensland, Australian Capital Territory South Australia and Northern Territory. “This is a really exciting way to explore the virtual film festival experience with a great new Australian film. We would love to hear about the midnight screening party in Alice Springs through to the matinee session in a living room in Goolwa. Adelaide Film Festival home delivery,” said Adelaide Film Festival Director Amanda Duthie. “The World Premiere of Fell via the Internet is a game-changer in a multi-screen world. It’s democratic, it’s inclusive and it’s about time,” said the film’s producer, John Maynard. This entry was posted in Article, Distribution, Films and tagged Adelaide Film Festival, AFTRS, Amanda Duthie, Daniel Henshall, Fell, John Maynard, Kasimir Burgess, Matt Nable, MSAB, Nashen Moodley, Nick Bolton, State Theatre, Sydney Film Festival, TEN ALPHAS, The Art of Perseverance in Australian feature film making on June 10, 2014 by n1ch0la5b0lt0n.